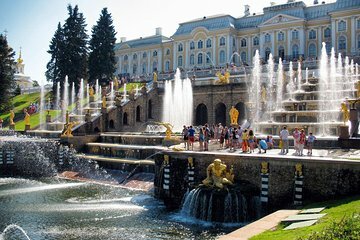 Witness the grandeur of Peterhof inside and out on a private 5-hour tour from St Petersburg. Travel by air-conditioned vehicle to the estate, enjoy priority access, and awe at the extravagant interiors and gardens with an art-historian guide. Admire showpieces such as the Throne Room and Ballroom as you hear how Peter the Great designed the palace in the early 1700s. Stroll through the Upper Garden and fountain-studded Lower Park; and view highlights such as Peter’s original Monplaisir palace. Finish with a relaxing, scenic boat ride back to St Petersburg. Elena was an excellent tour guide and moved us along in front of big tour groups allowing us to spend more time looking.